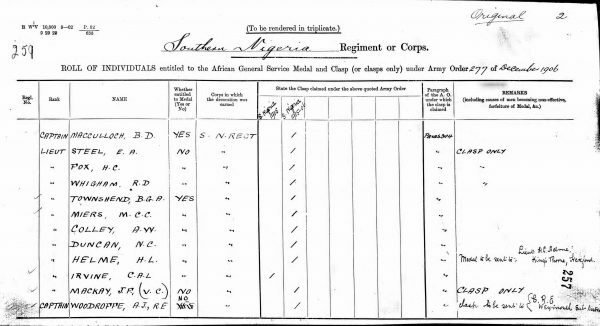 After the Anglo-Boer War he took part in the punitive 1905-06 Bende-Onitsha Hinterland Expedition (see below). 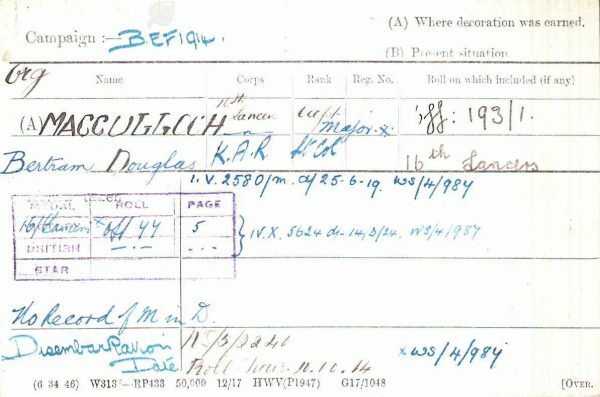 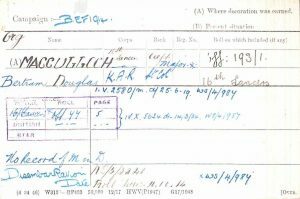 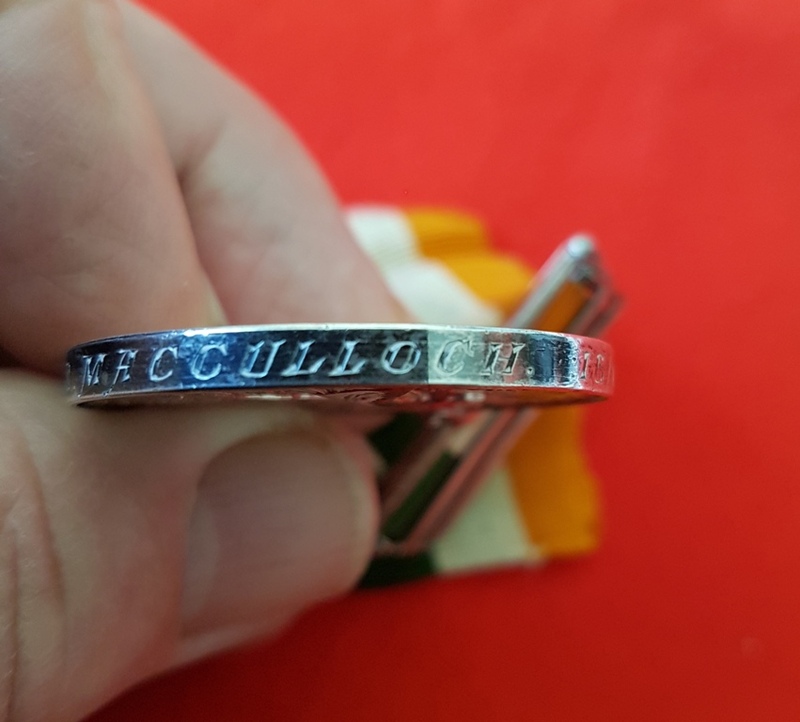 Bertram Douglas MacCulloch was born in March 1877 and appointed a 2nd Lieutenant in the 7th Dragoon Guards direct from the Royal Military College in February 1897. 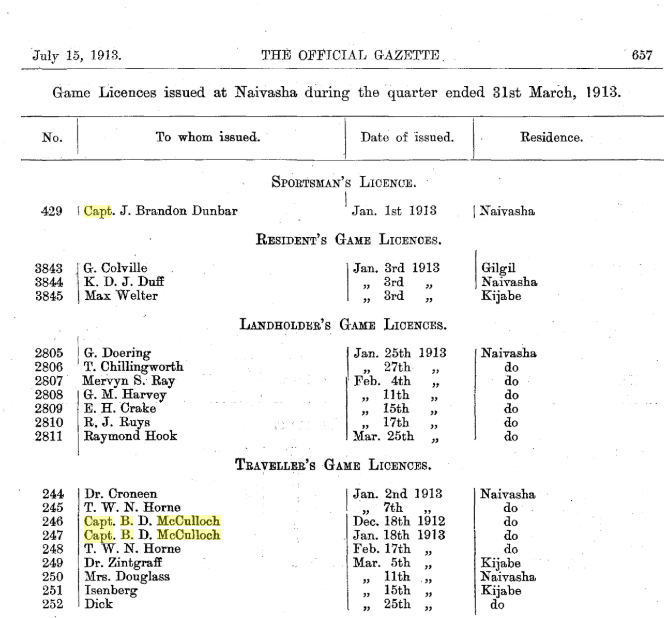 Exchanging into the 16th Lancers in the rank of Lieutenant in October 1899, he was advanced to Captain in December 1901. 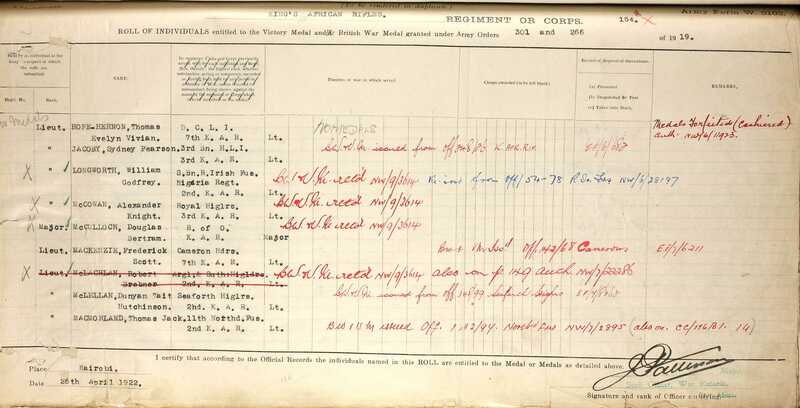 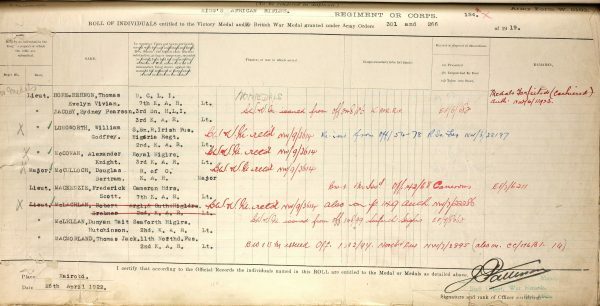 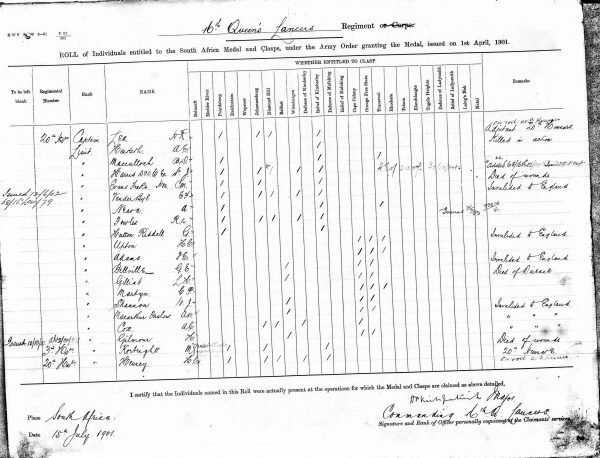 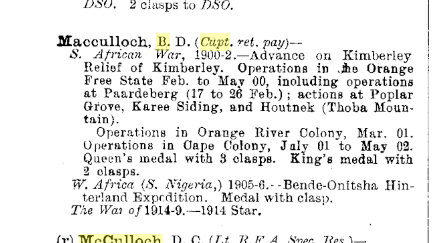 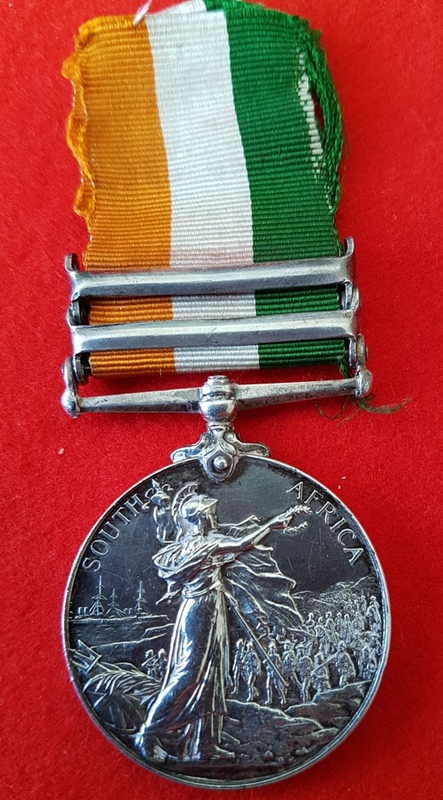 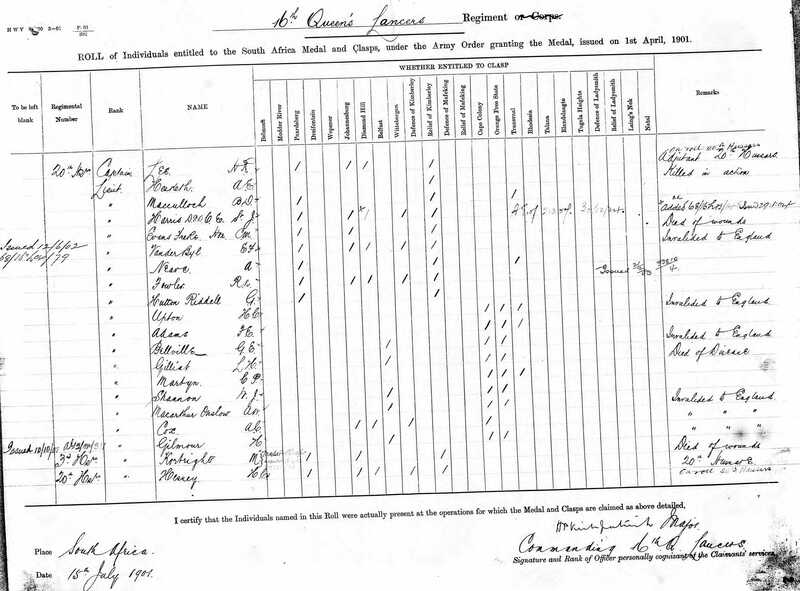 He took part in the relief of Kimberley, see service summary image; operations in Orange Free State, February to May 1900, including operations at Paardeberg and actions at Poplar Grove, Karee Siding and Houtnek; in Orange River State, March 1901, and Cape Colony, July 1901 to May 1902 for which he was awarded the QSA and KSA as listed below. 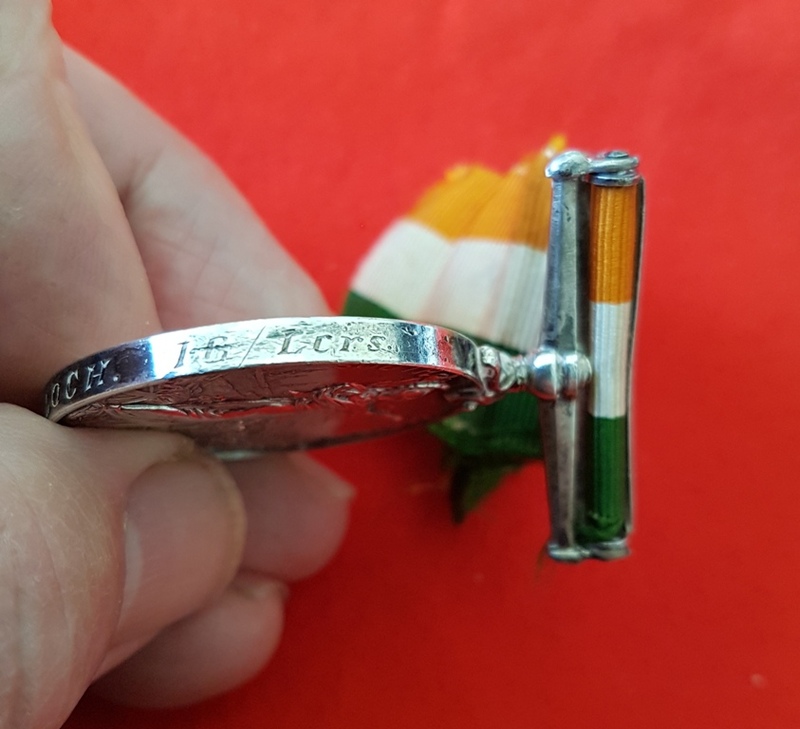 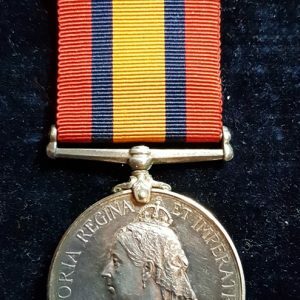 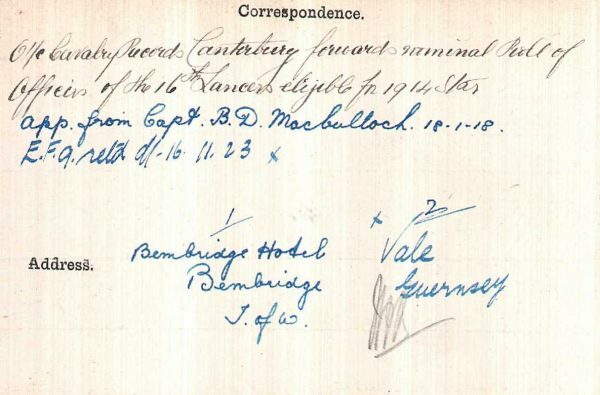 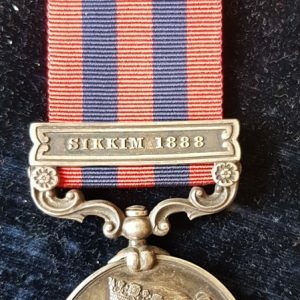 Trenchard and Mair received D.S.Os, while for his own part MacCulloch qualified for the relevant Medal & clasp and returned home on sick leave in August 1906. 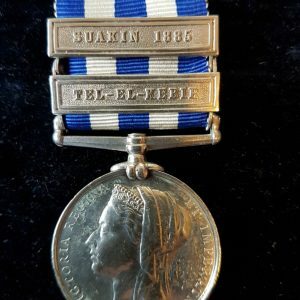 Two years later, after fracturing a leg in two places in a polo accident, he reverted to half-pay. 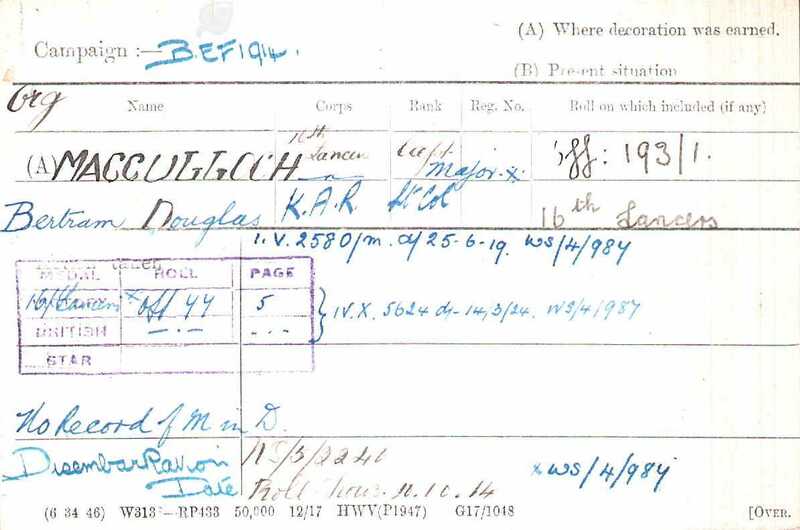 Having then been placed on the Reserve of Officers, MacCulloch was recalled on the outbreak of hostilities in August 1914 and went out to France as a Captain in the 16th Lancers in early October 1914, official records confirming that he was hit in his previously injured leg by a shell splinter ‘or something’ at Bailleul on 1 November 1914. 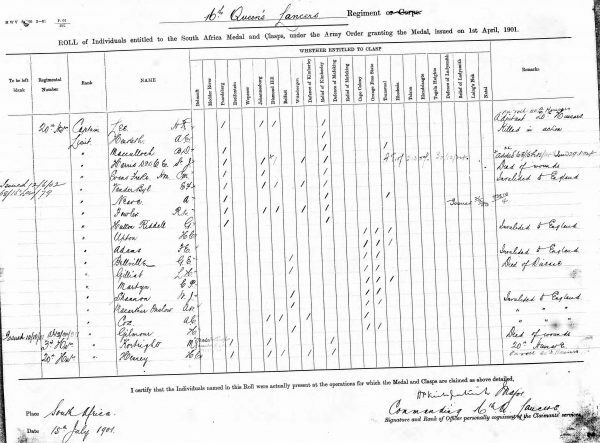 No doubt as a result, he was transferred to No. 22 Remount Squadron in March 1915, in the temporary rank of Major, and remained similarly employed until ordered home that July as a result of an altercation with a French cab driver at Marseilles, MacCulloch striking the latter with his whip – and apparently a Gendarme who arrived on the scene shortly afterwards. 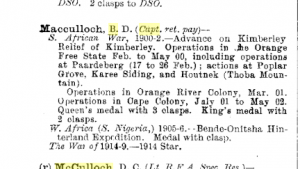 In July 1916, MacCulloch was embarked for East Africa for command of a Mounted Infantry unit, but owing to a shortage of horses, ended up as second-in-command of the 1st Battalion, 3rd King’s African Rifles, an unhappy appointment due to his old leg injury and, it would appear, some disagreements over patrol work. 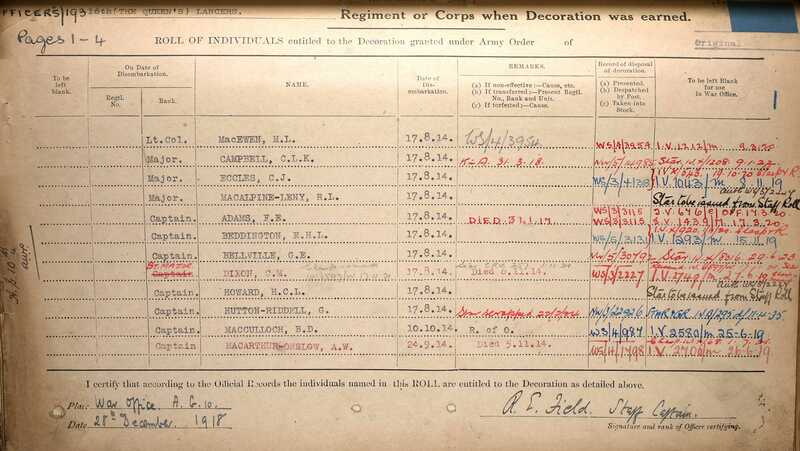 He once more returned home, where he would appear to have rejoined the 16th Lancers, and was eventually placed on the Retired List in the rank of Lieutenant-Colonel in the 1920s. 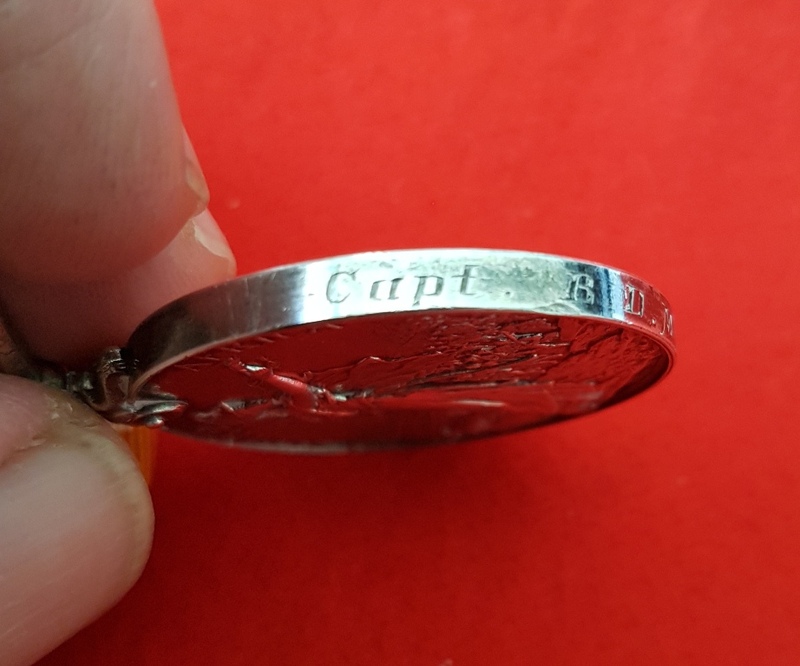 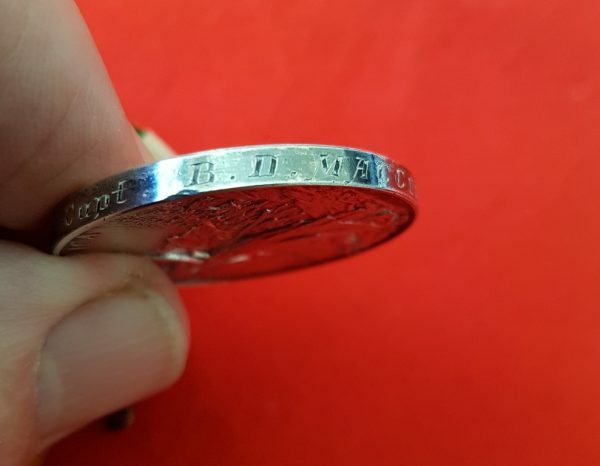 It is interesting that his address is given, on his Medal Index Card, as Bembridge, Hotel, Isle of Wight. 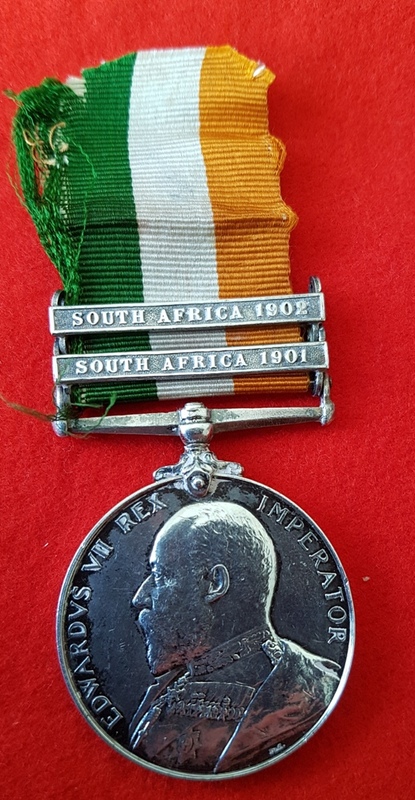 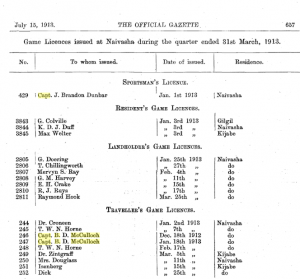 Accompanying images, apart from the relevant medal rolls are the photograph of Officer who took part in the Relief of Kimberley in the Anglo Boer War, where he is identified, and also the Kenya Official Gazette Game Licence List where he was issued his Traveller’s Game Licence for 1912 and 1913 licence for the Naivasha District. 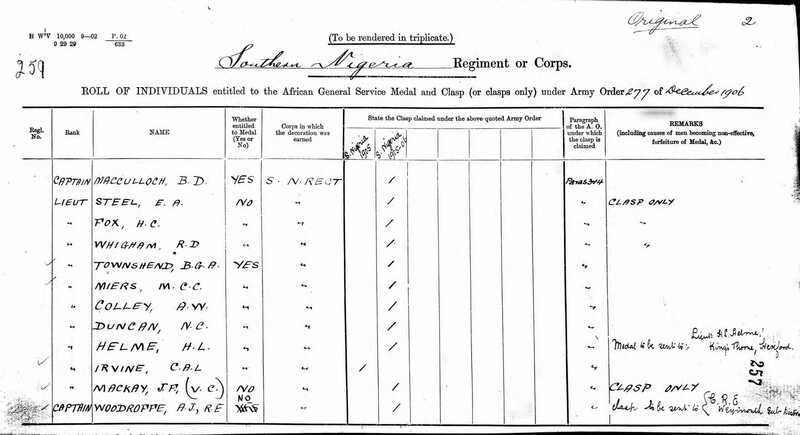 Having served in the Cavalry in South Africa and taken part in the punitive expedition against cannibals in Nigeria he died in Brighton February 1940. 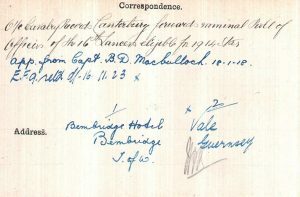 The House of Lords on Tuesday dismissed an appeal Captain Bertram Douglas MacCulloch, of 16th (Queen’s) Lancers, who sought to obtain his share in the estate of his grandfather, the late Mr James MacCulloch, of The Trees, Barrhead, although the will of the latter declared that, the estate should not be divided until the death of the testator’s last surviving child, and although two of the children survive. The appeal had been taken from the Second Division of the Court.